WOOD is the dominant element in 2018, bringing support and resources throughout the year. 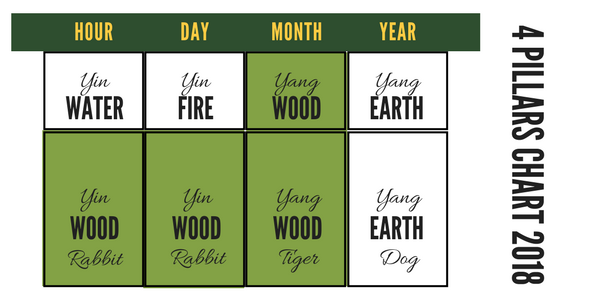 The chart presents DOUBLE EARTH, offering multiple opportunities to grow, however, the year of the Dog lacks inner essence to make things happen. It requires a lot of luck and effort to get to new achievements. This is a year of completion and consolidation, a year to strengthen the foundation of what you started in the previous year. The METAL element is missing in the annual chart; this makes it difficult to make wealth and find money-making opportunities. However, there is a hidden Yin metal showing up in August and September, favoring the patriarch of the family. The support brought by the wood element will help to find resources to make money, but you need to be alert to find those opportunities. Wealth Luck is indirect. Here are some suggestions to display at home to make up the lack of the metal element in the chart.